All stock components, some X-100s, some X-200s. Everything runs great. Oddball colors were painted a long time ago and just rubbed out and decaled. Some original decals. Some are static kits converted. Just digging these things. The BatMobile is a very old build and it's really nice. RommelsRod... I'll get to him on a stock chassis, too. 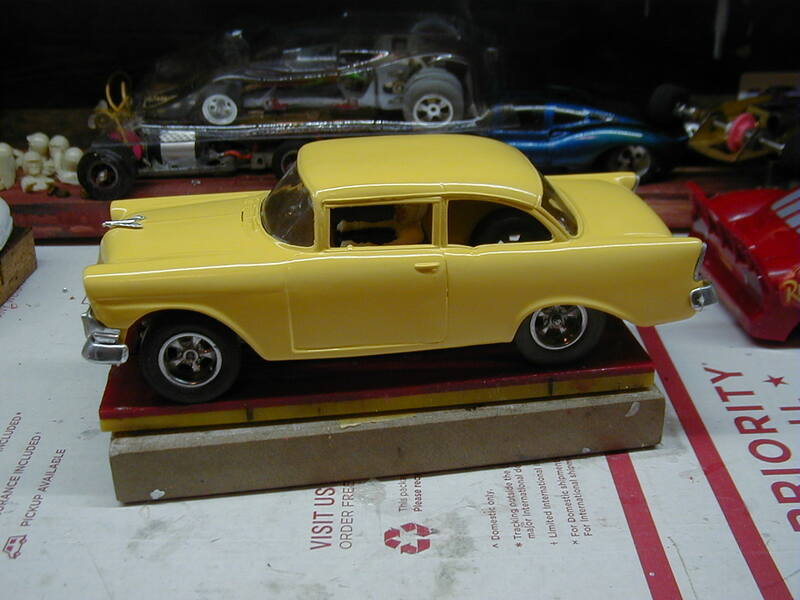 The AMT Impala is being re-worked. 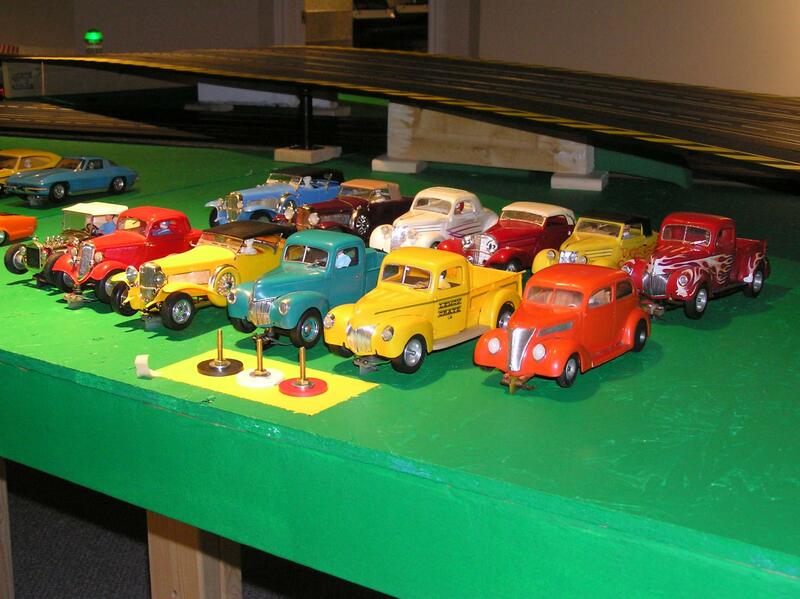 Fine collection of cars Steve! I'm familiar with Monogram's '55 Chevys yet don't own any. I didn't know they had a '56, too. 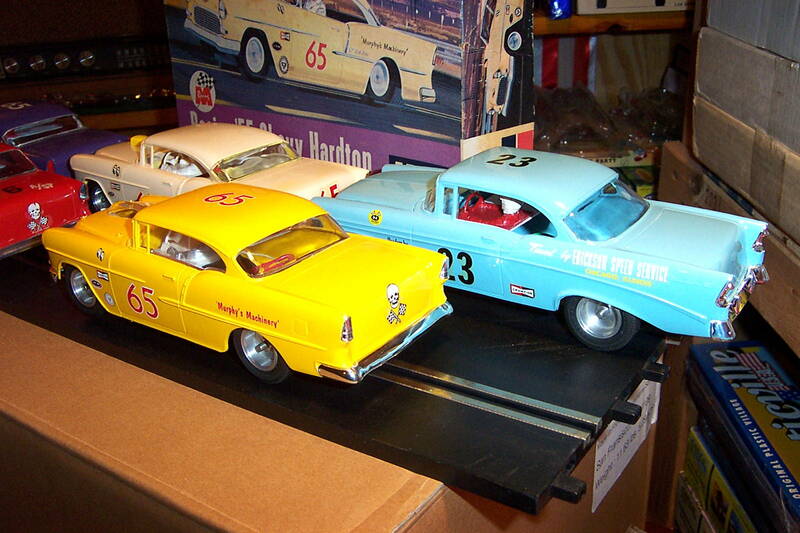 I have a unbuilt kit of their '58 T-bird I may build for slot racing or drags. 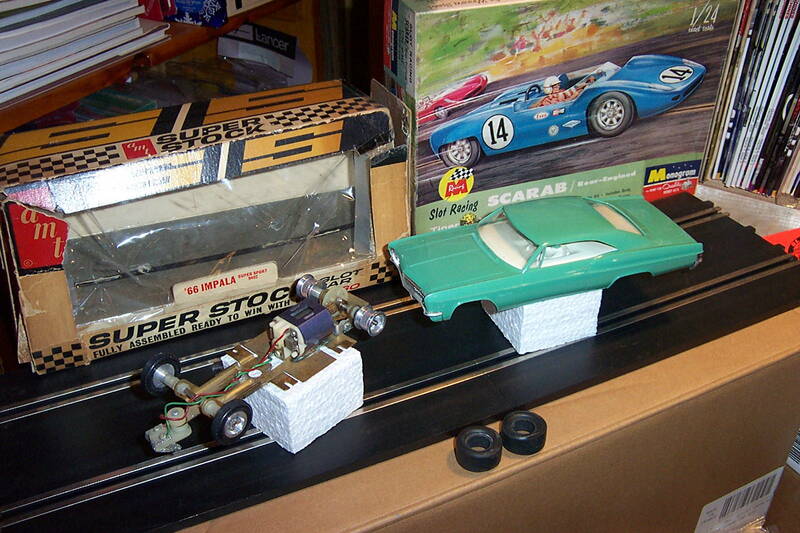 Just an FYI, there was an AMT '66 Impala Super Stocker on eBay the other day that sold for over $300. And it wasn't nearly as clean as yours either. The ‘56 is a molded blue static kit, simple conversion using a Professor Motor '55 front mount and my own rear post system that mimics the originals. The Impala came off of a 'live' auction here on eBay a couple or so weeks ago... $200.00. It is mint. Bought it by accident really. That auction was loaded with Monogram stuff, too. 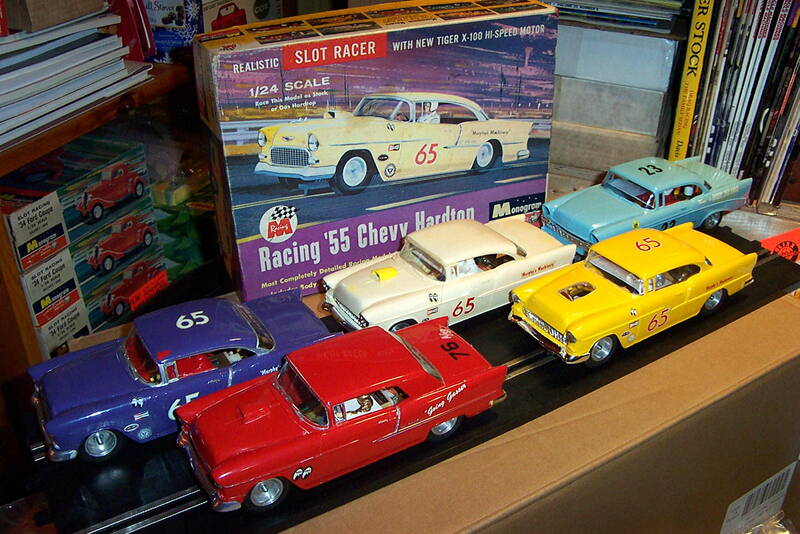 Revell did offer the '56 Chevy as a slot car body. 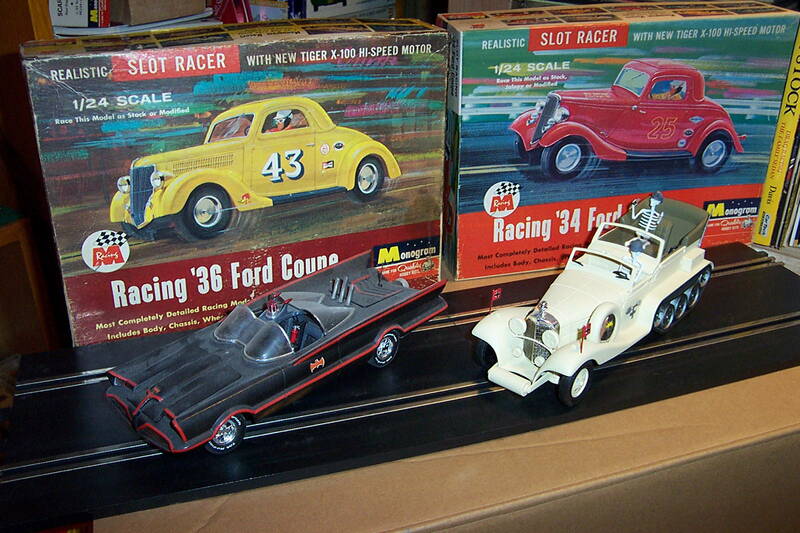 Their 1963 model kit came with a front and rear mount to fit the model and a Revell 1/25 frame. 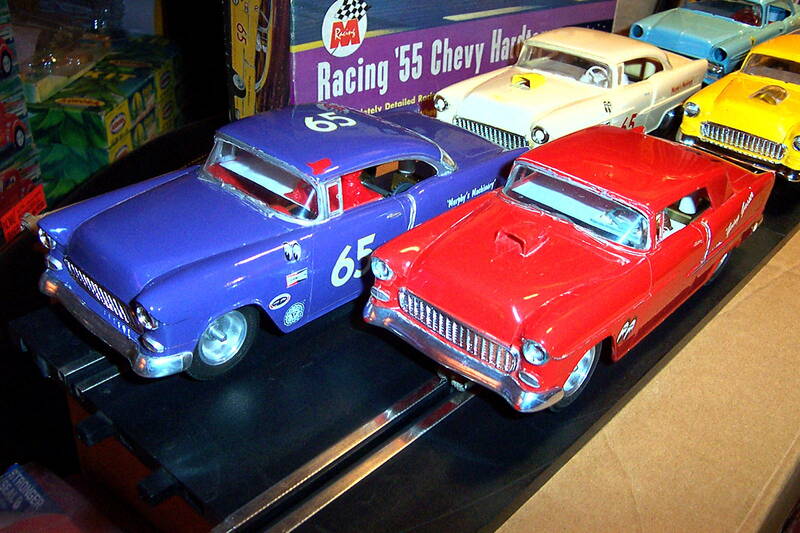 Not every day you could build a slot car with opening doors, hood, and trunk!!! Steve it's the blue 36D. 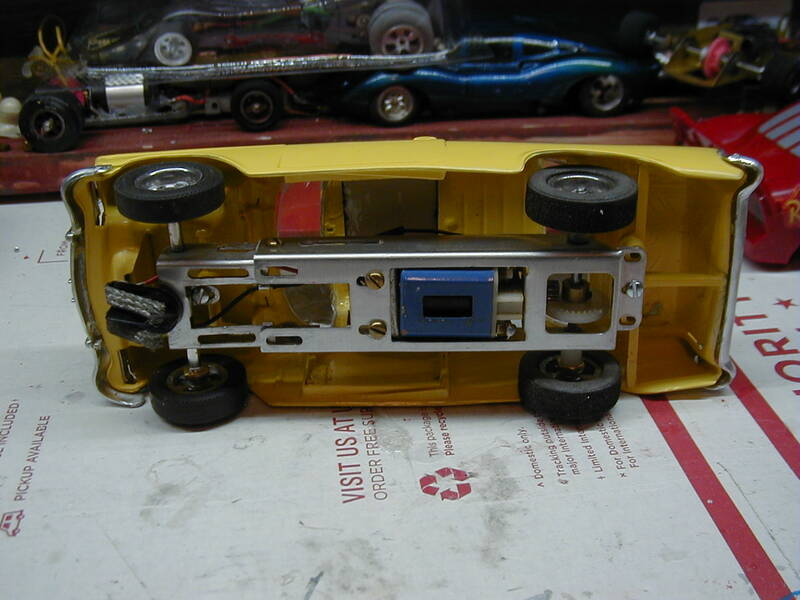 It only ran one lap after I put it together and it was a used chassis so I'm sure it is all in working order, Not much goes wrong with these simple cars. Steve, the last NH commercial raceway closed in 2010 & there hasn't been a local track since. There is a small home/club group that races a couple 1/24 hardbody classes, scratch jalopies & late models on H&R or FCR chassis. One guy in the club has a Tunkel 4-lane Mini-orange, another built a 5-lane oval. There are a few 1/32 home tracks scattered throughout the state, but I'm not updated as to where they are. I live about 18 mi. southeast of Antrim, toward Manchester. These Monogram cars are habit forming...I've got one in the works for a while now. I hope to have it out this Fall in time for the C.A.R.S. meeting in October. Maybe we'll have something to give the AMT Chevy a run for it's money too ? 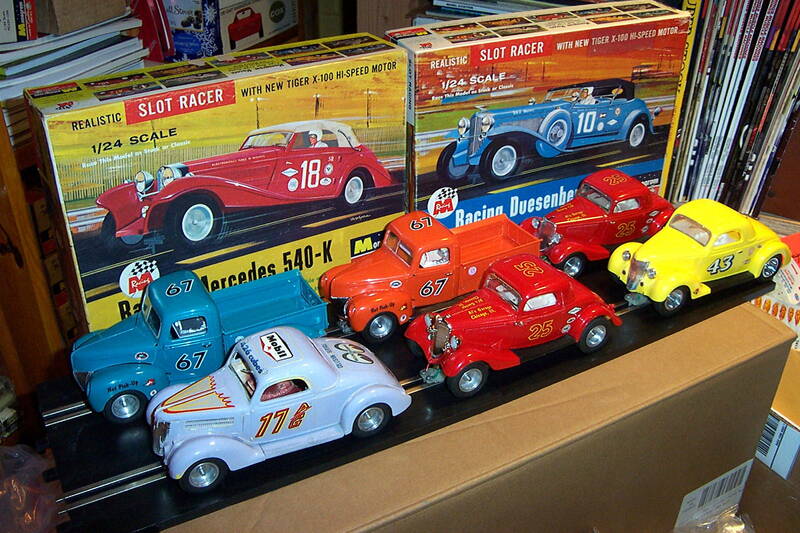 That"s a realy nice group of cars, hardbodies tend to show more detail than vac. formed bodies IMO. The AMT brass chassis was a good design. The biggest issue with the Super Stockers is the narrow rear tread width. The chassis and motor was a fine combo. It is a superior chassis to the the big Monogram cars. Probably the Impala will be a better running car then you think, if compared to cars like the Monogram 55. I have built a few of the AMT brass chassis with FK 180 motors and made decent running canam cars using the Lola or Mclaren bodies. That chassis & motor combo was a favorite of the late Rocky Russo too. He was always raving on here about how good it drove. Rocky's big thing was the 1/32 version. 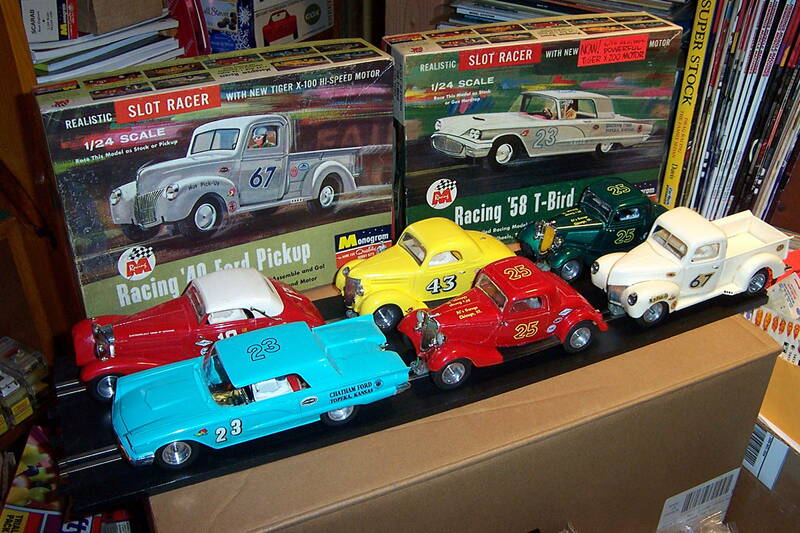 It was probably the best of the 1/32 designs back in the early 60's. They had a fixed wheelbase, but were the best of the factory frames. Here's a shot of one of our recent race nights. We try to keep these stock and have lots of fun racing them. Some are originals some clones but using original running gear. Yes , it is Carrera track with power from a big 12V transformer, in Pickering Ont. We also race on Strombecker and a routed track.